Like I had mentioned in the previous chapter, there are two techniques based on which you can pair trade. The first technique that we will discuss starting now, is usually referred to as the correlation based technique. I consider this as a fairly standard approach as many traders get their pair trading handholding of sorts using this approach. We need to learn few jargons before we get started on the actual technique, so let’s get to that straight. The jargons we will talk about in this chapter are related to tracking pairs. At this stage, I just want you to know what is what. We will connect the dots as we proceed. 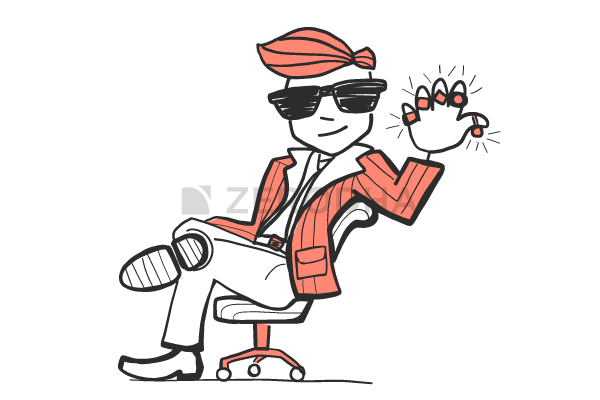 Spreads – The spread, is perhaps the most versatile jargon used in the trading world. For example, if you are scalping the market then the word spread refers to the Rupee differential between the bid price and the ask price. Now, if you are doing an arbitrage trade, then the word spread refers to the difference between the prices of the same asset across two different markets. In the pair trading world (actually, just correlation-based technique), the word spread refers to the difference between the closing prices of two stocks. 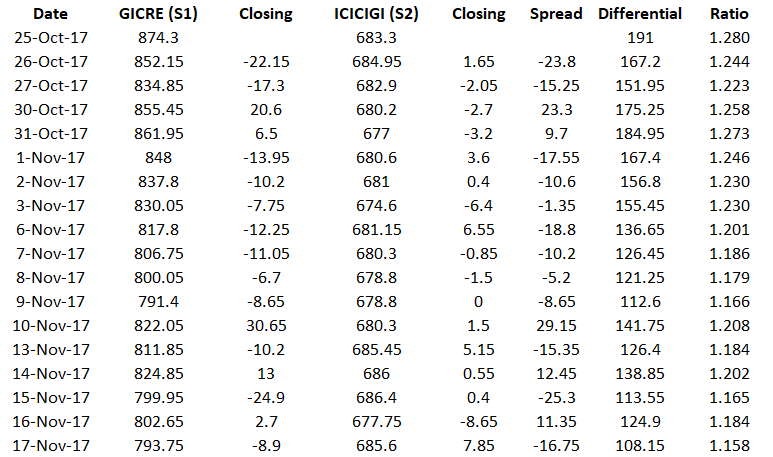 I’ve calculated the spread for the last couple of trading days, this should give you an idea of how the spread ‘runs’. 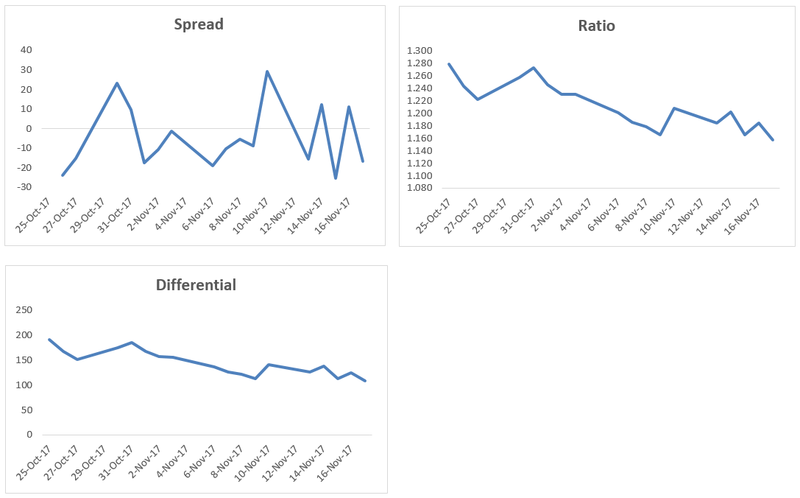 Also, since I’ve calculated the spread on a daily basis, traders refer to this as the ‘historical spread’. Of course, there are other possible combinations which lead to the expansion of contraction of the spreads. More on this later. Here is something you need to know about differentials – if you are using spreads to track pairs, then you can use it on an intraday basis. But unlike spreads, the ‘differentials’ is not a great technique to track pairs on an intraday basis, its best used at an end of day basis. Of course, more on these things later. For now, let’s just focus on busting some jargons. Ratio – I find the ratio bit quite interesting. The ratio is essentially dividing the stock price of stock 1 over the price of stock 2. Or it can be the other way round as well. So what are these things that we just looked at – spread, differential, and ratios and how are they related to pair trading? Well, as you can imagine, these are the different variable which helps us measure or quantify the relationship between two stocks, which we consider as pairs. The graph tells us how the two stocks move with respect to each other. For instance, if we consider the spread, we know it expands if the closing value of S1 is positive and S2 is negative and the spread contracts if the closing value of S1 is positive and S2 is also positive. Hence, for this reason, we need to look at the chart of the variable we are following, the variable could be spread, differential, or the ratio. We need to track the movement of the variable and figure out if the spread is expanding or contracting. This leads us to the next two jargons. Divergence – If the ratio or the spread between the two stocks is expected to move apart or alternatively, you expect the graph to move up, then this translates to something called a divergence. When you expect your variable to diverge, you can make money (or at least attempt to make) by setting up a divergence trade. Convergence – If the ratio or the spread between the two stocks is expected to move closer or alternatively, you expect the graph to move down, then this translates to something called as a convergence. When you expect your variable to converge, you can make money (or at least attempt to make) by setting up a convergence trade. Now here is the big question – what makes you believe the variable can either converge or diverge? When do you decide to set up a trade? What are the triggers? How do you set up a trade? What if the trade does not work out? What is the stop-loss for such trades? Well, even before we answer these questions, how do we qualify two stocks as a pair? Just because two stocks belong to the same sector, does that mean they qualify as a pair? For instance, does ICICI Bank and HDFC Bank qualify as a pair because they both belong to private sector banking? The actual number gives us a sense of the strength of this movement. In a loose sense, the closer it is to +1 (or -1) the higher is the tendency for the two variable to move in tandem. A correlation of 0 suggests that the two variables are not related to each other. From the above, we know a correlation of +0.75 suggests that the two variables move not only in the same direction but also tend to move together closely. Note, the correlation does not suggest the extent of the move, all it suggests is that the move in the same direction is likely to happen. For example, if Stock A moves 3%, and the correlation between stock A and stock B is +0.75, then it does not mean that Stock B will also move by 3%, all that the correlation suggests is that Stock B will move up positively, just like Stock A. But, there is another twist here – suppose stock A and Stock B are correlated at 0.75, and the daily average return on Stock A and Stock B is 0.9% a 1.2%, then it can be said that on any given day, if Stock A moves above its daily average return of 0.9%, then stock B is also likely to move higher than its daily average return of 1.2%. Likewise, a correlation of -0.75 indicates that the two variables move in opposite direction (-ve sign) but they both tend to move in opposite direction. Suppose stock A moves up by +2.5%, then by virtue of correlation we know that Stock B is likely to come down, but by what degree will it come down will not be known. While we are at it, one more point on correlation. This bit is only for those interested in the math part of correlation. The correlation data makes sense only if the data series is ‘stationary around the mean’. What does this mean? – Well, it simply means that the data set should be sticking close the average values. Keep this line ‘stationary around the mean’ in the back of your mind, don’t forget it. This will come back to again, when we discuss the 2nd technique to pair trade, much later in this module. We will proceed with correlation as a measure to understand how tightly two stocks are coupled. In the next chapter, we will figure out how to calculate two different varieties of correlations. For now, I want you to be clear on Spread, Differentials, Ratios, Divergence Trading, Convergence Trading, and Correlations! Download the Excel sheet used in this chapter here. Things are getting interesting. Thank you!!! Any approximation on the number of chapters you are planning for this module? I plan to introduce two different technique to pair trade. I’m guessing each technique will have around 6-8 chapters. Convergence= i) spread approaches zero (from both the sides ie -ve and +ve) ii) ratio tains to one. iii) graph of spread moves towards y(vertical axis)=0 from y= -ve ie upward and from y= +ve to y=0 ie downward. I’m eagerly waiting as usual. Thanks! Please stay tuned, Kumar. Since zerodha is not allowing all stocks for intraday(eventhough they are eligible for intraday),Can we use cnc order type with full margin and square it off on the same day?Will it consider as intraday or stt charges are more??? Yes, you can use CNC order type and take long(buy) intraday positions and square it off the same day except for Trade to Trade segment stocks. However, you cannot take short positions due to liquidity risk(Read about auction penalties on short delivery here). Please give me the list of all t2t stocks sir.I want full list. Sir I’m very excited to see this module live. When you say pairs tracking can be used on intraday basis what does it mean? And while we are on the subject, can you suggest one good book on intraday trading techniques? Thanks a ton. Sir what about the book recommendation? I had asked for one book on Intraday trading techniques sir. Can you recommend one? Thanks in advance. Have you checked out ‘Trading for a living’, by Alexander Elder? Sir what is the significance of the reference to Jordan Belfort and pairs trading in your tweet? Sir, can you kindly elaborate a bit on this. what does the “average values” mean here? I suppose the average itself! Sir I recently discovered something called option adjustment. Do you think you’ll be writing about that or you think it’s not necessary? If you can point me toward a book regarding the same. Thanks in advance. Option adjustment? Can you share the context, please? Thanks. If the positions we have taken, goes against our target, we take an additional position either to break even or top contradict our earlier view, since we were wrong in our prediction in first place. No, we have to cut the loss. Will discuss this in detail as we proceed. Sir I will take it at face value if you say taking an additional position to break even in case our positions go wrong is a bad idea. But can you shed some light into why it’s bad thing? After all, breaking even is better than booking a loss right? Thank you. What if you do not breakeven as expected? Under such a scenario, you will be making a further loss, only with a greater quantity. This module is work in progress. Download option will be available once the module is complete. Hi sir. Can you please tell me how to get started with NSIM certification? Thanks in advance. It says in the certification portal that first one is current derivatives. Is that right? Am I registering for the right exam? Also, I’ve already read varsity multiple times sir. Printed out all the modules and gave it to few of my friends as well.. Thanks for the treasure..
Zerodha Varsity alone has given me more knowledge than all the other combined studies I have done related to trading. Thank you. Eagerly waiting more on pair trading. Sir, Im having a real problem drawing the graphs, can you please tell me the whole procedure? I have downloaded the sheet, the graph is already drawn but If Im trying to remake it I cant! Which version of excel are you using? YOu need to select the data and click on the insert graph option and select line chart as the graph type. While doing the calculations taking two stocks..what is the basis of keeping a particular stock as Stock 1 and the other as stock 2 and not vice versa ? 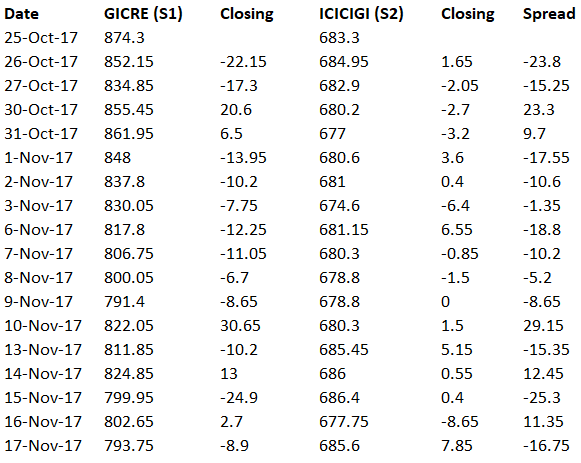 Is there any criteria or rule which defines between the pair that this particular stocks will be placed as stock 1 and 2 ? Very valid, will be addressing this point in Chapter 5. I have a doubt – at what point does your portal charge the brokerage, stt, etc. Why i ask this is – i had 1.71 lacs on Feb 20,2017 in my account. Till today from that day, I have made a net profit of around 2.78 Lacs on that amount. This means my total account value (if charges are not deducted) should be 4.49 Lacs but it is only 4.22 Lacs now. 1) I assume the difference is due to the charges (brokerage, stt, etc). Please confirm if that is the case. 2) Are they deducted whenever we square off positions? Or? Brokerages and taxes are charged at the end of trading for all your trades for the day. You will also receive a contract note in your email with the details. How to use spreads on intraday basis and what are the setups for the intraday trade based on spreads ? 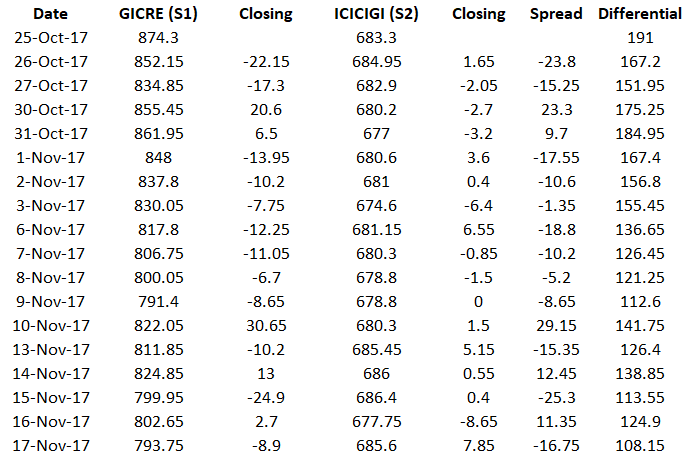 Whats is the success ratio for such spreads setup ? I’m not a big fan of spreads to track pair, I find the ratio a better deal. Anyway, the spread is just Stock 1 – Stock 2. Use the LTP to track this. Based on the data given in excel, I’ve calculated the Coorelation for HPCL and BPCL. Correlations arrived by correl() excel function are 0.82909, 0.198854 & 0.184658 for Close, % Return and Absolute Change respectively. 1) Why is there such significant difference in values themselves? 2) What can be inferred on the relationship between HPCL and BPCL based on figures above. Kindly correct me if my calculation is wrong. Which % return are you measuring, Manish? Also, the correlation seems to be good @ 0.82. Thanks for your response Karthik. I’ve arrived at the correlation value on data points of %return on HPCL and BPCL prices as 0.198854. I’m confused on how can the correlation be so less. Got it. The correlation should be applied to % return, which I think is quite low. Correlation on price should not be considered. Sir, how can I obtain the data regarding open and close prices of various companies. BTW , As always your teaching is Divine. ? Sir when module 10 will be available in pdf…. Eagerly waiting for it? There are more chapters coming up, Ravi. sahil here as discussed the strategy of pair trading.so I wanted to ask how can someone pair trade nifty and sgx nifty as sometimes both they act differently and then again then start moving in the same direction so there is an arbitrage opportunity so wanted to ask how can one place orders in Singapore exchange ? Unfortunately, you cannot Sahil as SGX is not available to trade in India. In the data you mentioned in the attached excel, the correll come at -0.21. Is it correct? Kindly guide if i am wrong. I guess it is correct, Deepak. Hi, data as on 03-04-19 for goldm silverm gave me 0.952 as density output. However, when i inserted today’s close (assumed) and got a new density output, the data for 03-04-19 changed from 0.952 to 0.947. I now think there is nothing wrong. The mean had to be changed and so did SD and so the density curve too will change. No, that is absolutely fine. Two possibilities – ether gold or silver or both made a decent move y’day. Or the oldest data point (which gets replaced by y’day’s new data point) was a large value. Please do check for this.